Cancer is a complex problem that needs multi-approaches to achieve healing. The strategy is to heal from within, while at the same time, resolve some uncomfortable symptoms. The Cancer Care Therapy is a healing-orientated therapy that is being used since 1995, mostly by patients in Malaysia, Singapore, Indonesia and Thailand. There are also patients from Australia, UK, France, US and the Philippines who follow the Cancer Care Therapy. This is your sickness and only you can heal yourself, others can only help. Living a positive life and managing cancer is your responsibility, not the doctor’s. If you refuse to change your ways and lifestyle or if you refuse to provide a helping hand to the healing power within you, who else can? Our experiences show that those who actually participate in the healing process benefited and won. CA Care does not substitute medical doctors. We strongly advise you to get the best from medical science, but at the same time, know of the limitations of the science itself. There would come a stage when there is only that much a doctor could do and no more. Therefore, you need not always leave your fate entirely to your doctors. It is written that there is no single cancer treatment that is universally effective or guarantees a complete cure. In cancer treatment, there is nothing certain except the uncertainty of its result. The conventional medical treatments for cancer consist of surgery, radiation and chemotherapy. The patients pay dearly in terms of pain, suffering and money. On top of this, there is no guarantee that these treatments will work for you. It is estimated that the “success rate” (not complete cure!) was approximately 40%. What this means is that 60% of the cancer cases do not respond to conventional medical treatments and they are termed incurable or terminal. These patients generally turn to alternative therapy, after that. CA Care Therapy uses herbs that help people with cancer. This is well documented in the book The Cancer Care Therapy (available at our centers and Books on Cancer website). There are a few misconceptions about the use of herbs. Also, there are some people who are dead against the use of herbs. 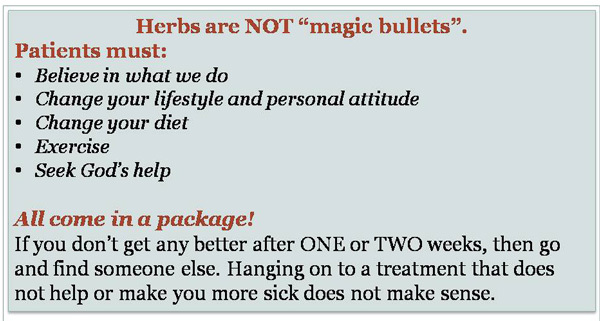 Maria Treban in her book: Health Through God’s Pharmacy answered the nagging question of whether one can overuse herbs. She said, Using herbs is never harmful. On the contrary, they just maintain your health. I am a living example. I have been drinking herbal teas since 1949! In his book: The Best of Traditional Chinese Medicine, Dr. Xie Zhu-fan, a WHO consultant on traditional medicine, presented data to answer such questions as whether herbs contradict or are harmful when used together with surgery, radiation or chemotherapy. He concluded that herbs are beneficial to patients during their chemotherapy and radiotherapy. Indeed our experiences also show that the use of herbs benefit cancer patients who were undergoing conventional medical treatments. The question of harm or contradiction with modern drugs does not arise. Also, many educated patients are concerned whether the use of herbs has side-effects. The use of correct herbs is never harmful as evidenced by the testimonies of the people taking these herbs. CA Care has come out with a book: Food & Cancer, reflecting our belief that the main contributing cause of cancer is food, eating habits and lifestyle. We also know that many cancer patients who are doing well suffer relapse soon after reverting to their previous bad dietary habits. We believe that diet by itself cannot heal cancer as much as drugs alone cannot cure it. However, diet is important and can determine the progress and direction in the healing of cancer. · Fresh vegetables either raw or cooked. · Lots of fresh juices and fruits. · Whole grains, cereals, seeds and nuts in as unprocessed form as possible. · Avoid meat and dairy products. · Avoid table refined salt, white sugar and cooking oil with trans-fat. · Avoid all preserved, canned or processed food. We advocate that you do proper exercise daily but do not over-strain yourself. Have a good rest and make sure you sleep well. Cultivate a positive attitude. Avoid anxiety, anger and other negative emotions. Learn how to forgive and forget. Live a loving and stress-free life. We also find that those who receive full-hearted family support and tender loving care, manage very well. The love, care and understanding of the spouse, children and relatives are very important. At the same time, the sick are encouraged to turn to God for healing and peace.